Works perfectly! Fits large band perfectly. Very happy that the connector showed up so quickly and was exactly what I needed! Q: The swivel in the middle has air coming out of it. Are those little dots air holes support have air coming out and why? I purchased a new one because I thought it was broken. Please explain. Could not find it in the description. A: The DreamWear mask has two vents one on the front of the cushion or nasal pillows and the other is at the top on the swivel elbow. The vents are so you can exhale and to flush the exhaled CO2 from the mask. All mask have vents or a valve between the mask and tubing for that reason. The DreamWear just happens to have two. 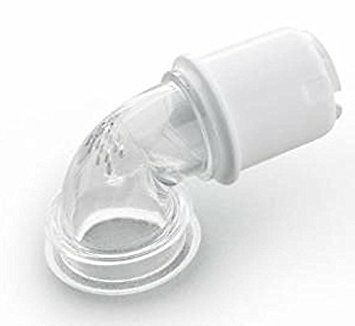 Q: Will this fit the phillips respironics pillow mask? A: This elbow is for the Philips Respironics DreamWear and fits any of the DreamWear configurations. It will not work with any of the other Respironics nasal pillow systems like the DreamWear, Optilife, or Go Life. A: I'm sorry but Phillips doesn't offer any other elbow for this mask. You might be able to find an elbow that has a different angle but you would need to use it in addition to the current elbow because of the exhaust vent. A: Unfortunately the 90-degree elbow is all that the manufacturer makes right now. Q: Does this need a special hose adapter or clip in part? A: No, if it doesn't fit your current hose its usually because part of your old mask is still in the end of the hose.